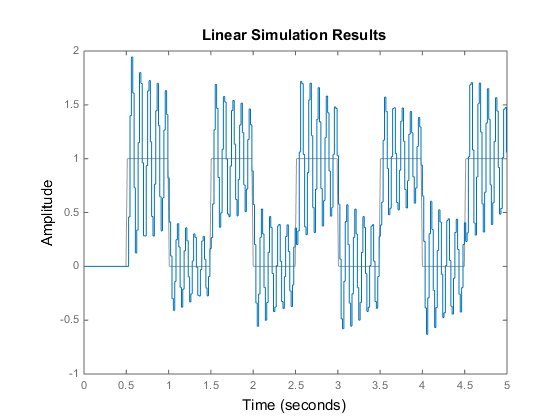 lsim simulates the (time) response of continuous or discrete linear systems to arbitrary inputs. When invoked without left-hand arguments, lsim plots the response on the screen. The input u is an array having as many rows as time samples (length(t)) and as many columns as system inputs. For instance, if sys is a SISO system, then u is a t-by-1 vector. If sys has three inputs, then u is a t-by-3 array. Each row u(i,:) specifies the input value(s) at the time sample t(i). The signal u also appears on the plot. The model sys can be continuous or discrete, SISO or MIMO. In discrete time, u must be sampled at the same rate as the system. In this case, the input t is redundant and can be omitted or set to an empty matrix. In continuous time, the time sampling dt = t(2)-t(1) is used to discretize the continuous model. If dt is too large (undersampling), lsim issues a warning suggesting that you use a more appropriate sample time, but will use the specified sample time. See Algorithms for a discussion of sample times. lsim(sys,u,t,x0) further specifies an initial condition x0 for the system states. This syntax applies only when sys is a state-space model. x0 is a vector whose entries are the initial values of the corresponding states of sys. If you do not specify a method, lsim selects the interpolation method automatically based on the smoothness of the signal u.
lsim(sys1,...,sysn,u,t) simulates the responses of several dynamic system models to the same input history t,u and plots these responses on a single figure. You can also use the x0 and method input arguments when computing the responses of multiple models. For more information about configuring this argument, see the LineSpec input argument of the plot function. y = lsim(___) returns the system response y, sampled at the same times as the input (t). The output y is an array having as many rows as time samples (length(t)) and as many columns as system outputs. No plot is drawn on the screen. You can use this syntax with any of the input arguments described in previous syntaxes except the LineSpec arguments. [y,t,x] = lsim(___) also returns the time vector t used for simulation and the state trajectories x (for state-space models only). The output x has as many rows as time samples (length(t)) and as many columns as system states. You can use this syntax with any of the input arguments described in previous syntaxes except the LineSpec arguments. 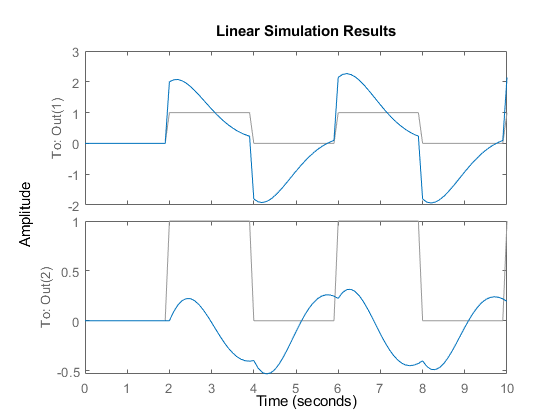 lsim(sys) opens the Linear Simulation Tool GUI. For more information about working with this GUI, see Working with the Linear Simulation Tool. Create the transfer function, and generate the square wave with gensig. Sample every 0.1 second during 10 seconds. The plot displays both the applied signal and the response. Load estimation data to estimate a model. z is an iddata object that stores the 1-input 2-output estimation data with sample time 0.1 seconds. Estimate a state-space model of order 4 using estimation data z.
sys is the estimated model and x0 are the estimated initial states. Simulate the response of sys using the same input data as the one used for estimation and the initial states returned by the estimation command. 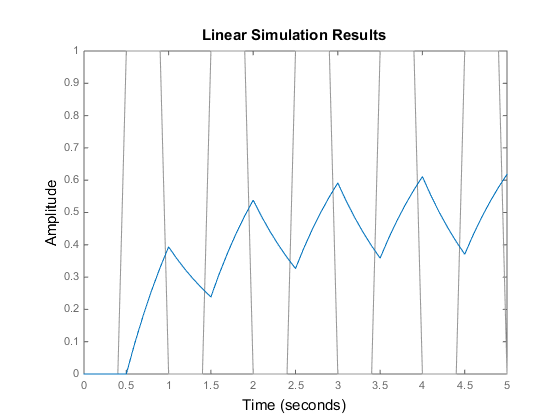 Here, y is the system response, t is the time vector used for simulation, and x is the state trajectory. 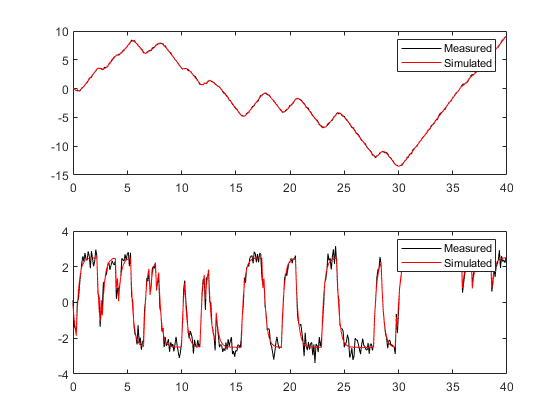 Compare the simulated response y to measured response z.OutputData for both outputs. Discrete-time systems are simulated with ltitr (state space) or filter (transfer function and zero-pole-gain). Continuous-time systems are discretized with c2d using either the 'zoh' or 'foh' method ('foh' is used for smooth input signals and 'zoh' for discontinuous signals such as pulses or square waves). 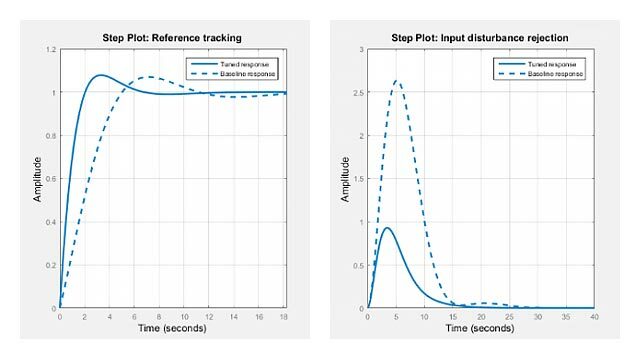 The sample time is set to the spacing dt between the user-supplied time samples t.
This response exhibits strong oscillatory behavior that is hidden in the undersampled version.